Cruise Gateway North Sea was working to develop and promote the cruise industry in the North Sea Region. It was a three-year project with 12 cruise-related partners from six countries, co-financed by the EU-Interreg IVB North Sea Region Programme. High growth rates of cruise tourism in Europe have been recorded in particular for the Baltic and Mediterranean Seas. However, so far the North Sea Region has not been recognized as a cruise destination of its own. Homeports are rare, multi-modal links lacking, regional economic effects underdeveloped and cruise circles missing. However in a booming market the North Sea Region definitely is an attractiveness holiday destination. How can a regional cruise policy ensure a sound performance of this industry? How can ports and related actors promote a regional maritime identity? How can growth be managed in a sustainable way? Will attention be paid to service bottlenecks? Will regional culture and nature of ports play a role? Cruise Gateway's project partners aimed to contribute to improved cruise accessibility in the North Sea Region on a sustainable basis, enabling comprehensive economic and social benefits. Cruise Gateway North Sea brought together 12 partners from seven countries, representing cruise ports, marketing associations, councils and cities. During the three-year term of the project, partners focused on marketing and branding, cruise and accessibility, and cruise and sustainability, with a series of workshops, conferences and best practice tours. A research study into ‘Incorporating sustainability in the branding strategy for cruising in the North Sea Region’. The emphasis was on the North Sea Region’s diversity of history, heritage and culture, landscapes, coast and countryside, traditional and modern architecture, vibrant cities and cosy towns and villages. The North Sea Region also offers the advantage of short steaming distances between cruise ports, a major factor for cruise lines looking to save fuel by reducing speed and distance travelled. 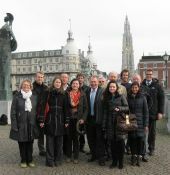 Best Practice Tour "Cruise and Accessibility"
Workshop in Kiel "logistic services to cruise ships"